Complimentary valet, self parking is available in the garage located behind our location. Del Frisco’s Grille is a stylish, modern restaurant with a vibrant ambiance where life is celebrated around the table. Boasting premium American classics infused with fresh, seasonal ingredients, the Grille’s thoughtful menu features Del Frisco’s Prime, hand-cut steaks and craveable, shareable dishes such as the signature Cheesesteak Eggrolls. With an award-winning yet accessible wine list and hand-crafted cocktails, Del Frisco’s Grille takes guests through a social culinary journey with each experience, no matter the occasion. Located in the Pike & Rose complex, between Rockville Pike and Executive Road on Old Georgetown Rd., just steps away from the White Flint Metro station. Valet is available on the weekends for $10 and self-parking is available in the garage directly behind us. *Reservations are accepted for indoor dining only. Patio seating is available on a first-come, first-served basis. We had no waiter for 20 minutes. I have been to this restaurant a few time. Food, service and the place are very good for casual and business meetings. No problem getting a table. Lovely flavors in corn soup, followed by fantastic steak salad. Can't wait to return! 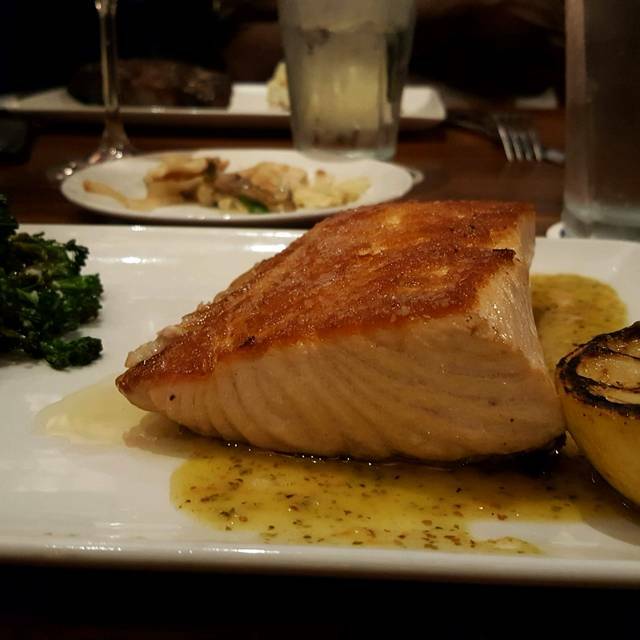 Great food, nice wine selection and outstanding service. We had a great time! 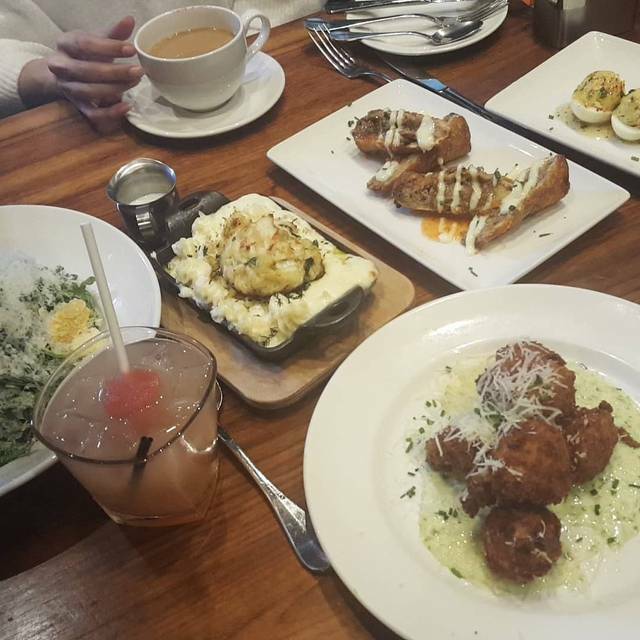 Good food with great friends is alway a good combo! The restaurant space takes your breath away and entering we were greeted with a warm smile by the Server. I let her know me and my fiancee name and we were checking in our reservation via open table. Jason our server presented with such style and grace. I appreciated that his uniform,and apron was clean and pressed. The food was so delicious it made my fiancee so happy he is usually not easily impressed. I'm happy to experience this time he was! The manager Magdiel Bastidas was an absolute marvelous meet and ultimately our interaction with him and the food/service is why we WILL come back. GOD BLESS & Thank You! Great atmosphere and delicious food. I had the ribs and they were cooked to perfection. The BBQ sauce was amazing. The lemon cake was very delicious and a big portion. I highly recommend this restaurant. When I initially made the reservation, I didn’t realize the restaurant was a chain, so when I realized it was, I was a little disappointed. But I was surprised and very impressed with the food, service, and ambience and already have recommended it to friends. I typically like this place, but this was not a good outing. 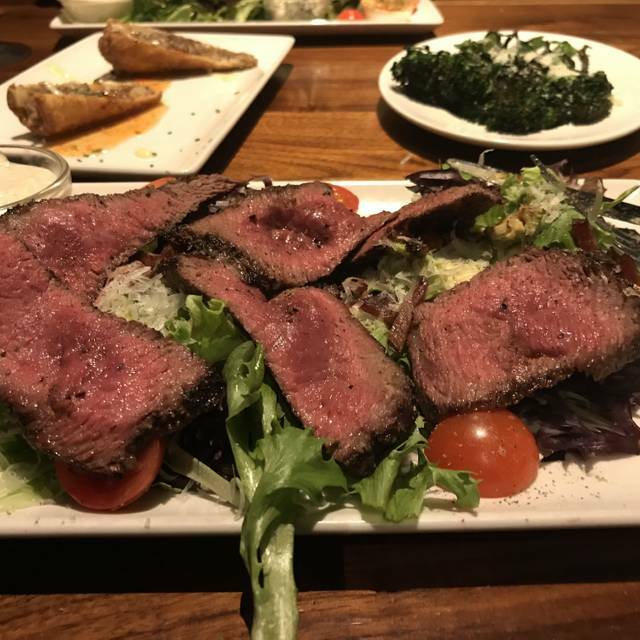 I got the steak salad and ordered it medium rare. It came raw in the middle so I sent it back. 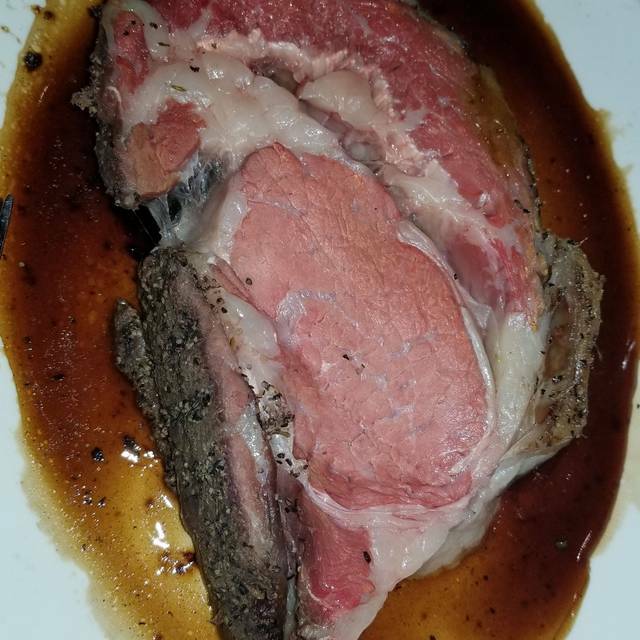 It came back out a second time the same way, so I sent it back again, and this time it came out medium rare in the middle and burnt outside. The manager brought my food the 3rd time and asked how it was. I told him to check back and I would let him know, but he never came and I was hungry. Also, I ordered the charred broccoli as a side for $7.50, and what they brought was like 8 tiny pieces of broccoli. It was pretty good, but a ridiculously small portion for that price. Burger and frites were outstanding. Ahi tuna salad was as well. We had a wonderful meal as always. We love to go to iPic movies down the block then Del's for dinner. It is a bit noisy in there when crowded and I do wish there was a bit more sound absorption but that seems par for the course with modern interior design. Also, you don't go to Del Frisco's for a budget meal. So, the question on value is hard to answer. Its pricey....but the food is also first rate and outstanding. They are no more pricey than any other high end steak house in town, though. If you like a good burger, get the prime burger....its outstanding. Alec was a great waiter and his suggestions were on point. Cheesesteak eggrolls are a must! This was my third visit to Del Frisco's. The first time was lunch, the second was dinner. This time, the service was very slow. The corn soup was too highly seasoned. I couldn't eat it. The flat bread was much too dry. If this were my first visit, I wouldn't come back. At this location the service was outstanding and the food avarrave. Had a great time with John as our server..
Dinner at Del Frisco's is something I look forward to when we visit Washington. The food is fresh, the service is attentive and the atmosphere is appealing. Made a reservation and they were a little behind schedule when we got there. General Manager came over, apologized, and offered us a drink. We ended up getting seated 20 or so minutes late (not really that big a deal) and the food and service were terrific. Ribeye was excellent as was the beet side dish (and the martini). General Manager came over again after the meal to make sure everything was ok. GM did a very nice job of smoothing over the delay. Really appreciate it. Would highly recommend for the food and the service. Service was great. Food excellent and good variety of steaks, seafood, salads and burgers. The cost was fair. Definitely will go back and recommend to friends. The only (minor) issue is that they ran out of prime rib at 7:30pm. Service and food were really good. Had a reservation and restaurant was fairly empty when we arrived. Had a table for 6 - of which there were many open tables. But they tried to give us a round table with bench seats Had to say no. I wanted some space to enjoy my meal. After some deliberation, another waitress moved us and said I agree this is much better! Made no sense to me! Everything was fine accept they did not manage reservations well. I group of us with 7:15 and 7:30 reservations were not seated until almost 8:00. 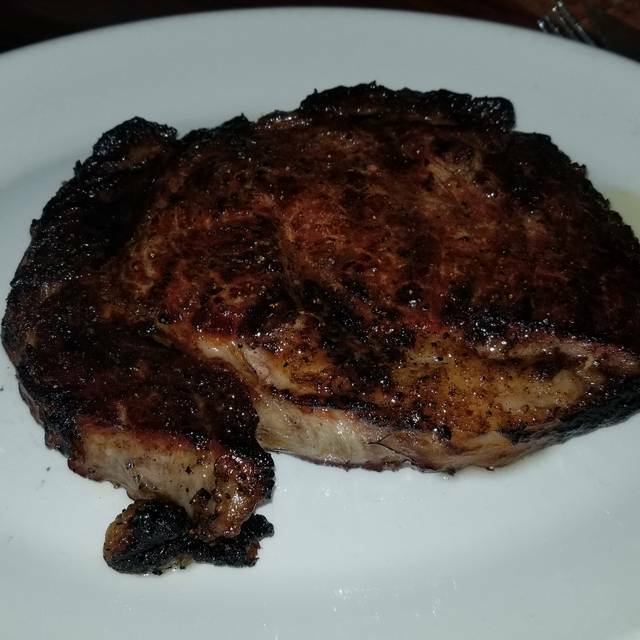 For a an expensive steakhouse to run out of steaks at 5:30 and then to serve filets that are grizzly and poor quality was really not acceptable. Had to return the filet and then wait a long time to get another one. The waitress was great but quality of food for the price was poor. The food was bad but the waiter was great and the manager was really nice. Lovely meal, excellent service and noise level was ideal for conversation during dinner. Manager came to our table and chatted with us which was quite nice. We were offered complimentary coffee which was unexpected and capped a great meal. Great food! Great server! Management worked the room greeting all the guests. We enjoyed ourselves immensely. Would visit again. 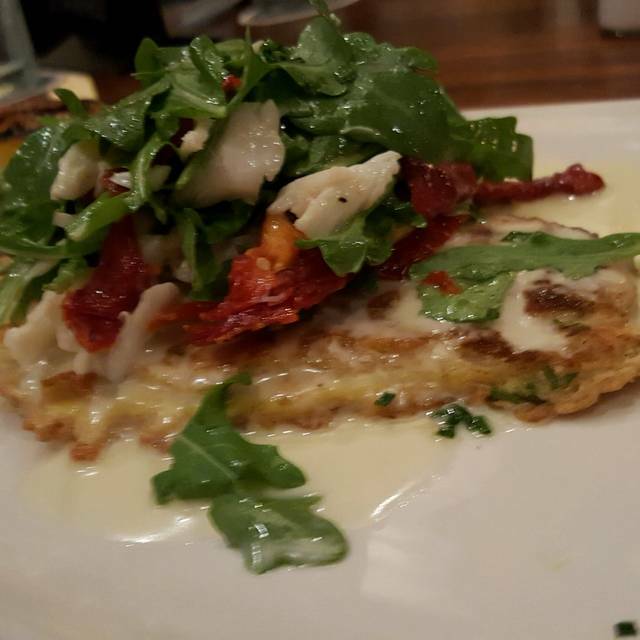 Our first visit to Del Frisco's was on Valentine's Day...so there was a limited menu. However, the choices were very good. Two interesting (and yummy) appetizers were Philly Cheesesteak Eggrolls and Artichoke Beignets. Steaks were outstanding. We've been to Morton's, Ruth's, and others, and these were comparable...maybe even better. Our waiter (Alec) was knowledgeable and friendly, and the attention we got from him and managers was just right. Definitely intend on re-visiting this place!! and ambience were all wonderful. Highly recommend! Overpriced for the quality of the food, can't recommend this to anyone I care about. Waiter was great. First time guest at this restaurant and I must say that I was very impressed by the service we got from our waiter unfortunately I don’t remember his name but he did an incredible job. We will definitely be coming back! 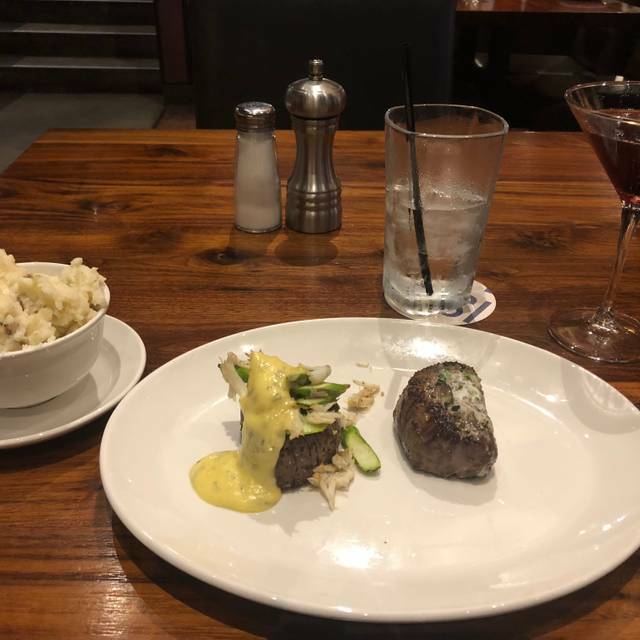 I have been to Del Frisco's several times throughout the year, and the food this time was not consistent with past experiences. The broccoli was burned or scorched, and the burger was dry. Not sure what happened? I gave it a low rating on food because this is a steak house grille. My daughter’s steak had to go back 3 times. I loved that they took it off the bill but this is a steak house, should have gotten it right the first time. Server was great, manager was great and our other food was amazing. The server was excellent the food was delicious but after making a reservation we had to wait for more than 15 minutes to be seated. There were a lot of other people who had reservations for the same time who were also waiting . We were then seated in the bar area at a terrible table area right behind a very very loud group of people. I had planned a very special dinner for my daughter‘s birthday and my husband‘s birthday and we were very disappointed . It is not up to par with the other local steakhouses. The food was great! The cheese steak egg rolls were phenomenal! The guac could have used a little bit of lime and salt but I understand some may not like it that way, therefore I do not knock them for that. 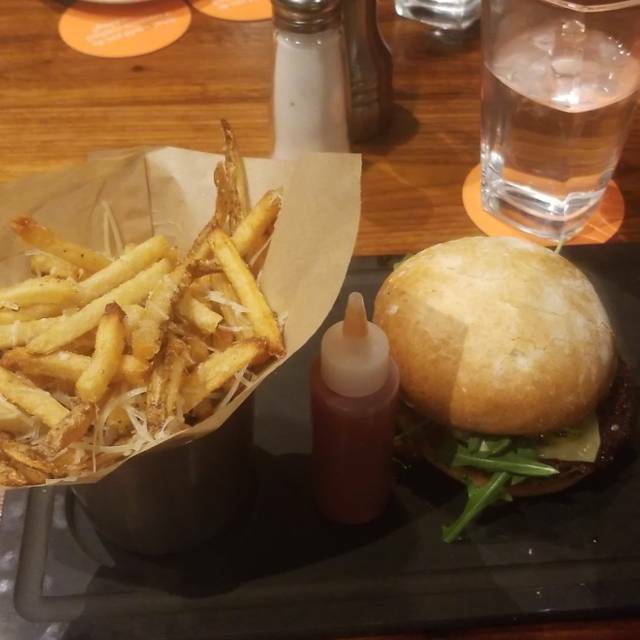 The two things I would suggest are that the filet burger, while very delicious, I would not order again. 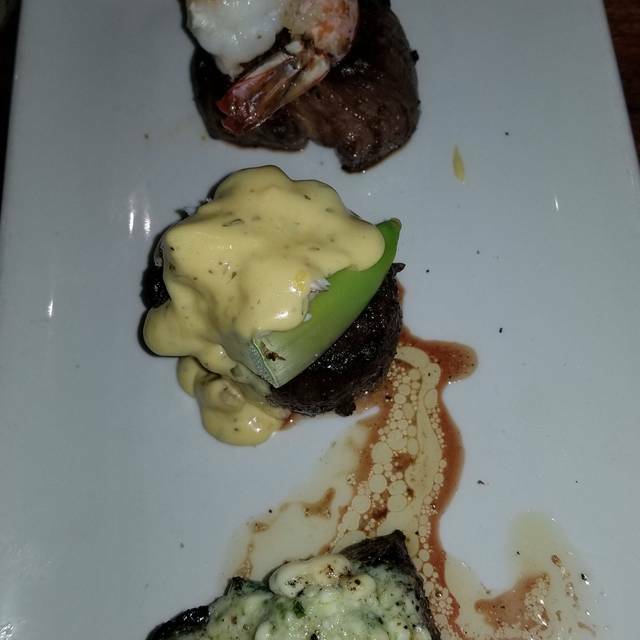 Also the waiter suggested an Oscar style filet for my lady, with crabmeat and hollandaise. These additions to a filet take away from the juiciness and flavor of the steak. That said the meat was delicious and tender! The dessert was tasty too! Very sweet but still delicious! The atmosphere was very nice! I was however disappointed that it seemed that the owner or manager greeted everyone around us but forgot us. All that said, I'd go here again to try everything on the menu!